Let's start Monday healthy, full of omega-3s, less fat, and herbaceous, zippy, and spicy Mexican flavors... and let's not work more than 25 minutes to put this dinner together! How awesome is that?! Yes, my friends! I'm taking about a 10 minute perfectly baked salmon with delicious roasted salsa verde and cilantro rice for dinner!! It may not be called "one pot meal" but this flavorful meal just needs a sheet pan, sauce pan (for cooking rice), and a blender/food processor. That won't be hard, isn't it? 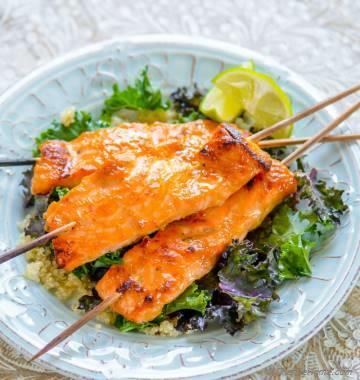 Salmon grilled, baked or broiled... makes a delicious lite dinner. 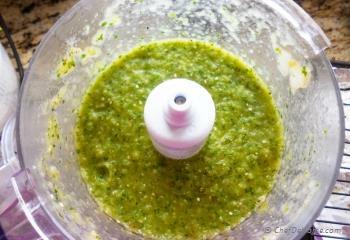 Plus when served with something lemony and herbaceous like salsa verde, it makes me look forward to dinner. I'm always on look to cook salmon different ways for easy and healthy weekday dinners. One thing I have learned while exploring all the recipes so far.. salmon, lemon and herbs make a match no one can't resist. 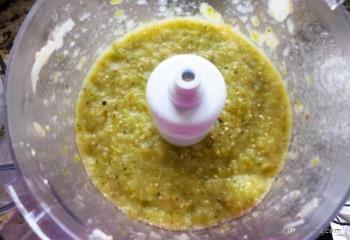 Speaking of which, I'm sharing this old picture of Salsa Verde from my Breakfast Chilaquiles post! Look at the picture! 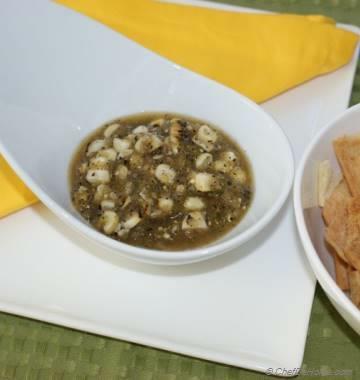 This bowl of beautiful green roasted tomatillo salsa is bursting with flavor! What I love most about this Salmon Dinner? 1. 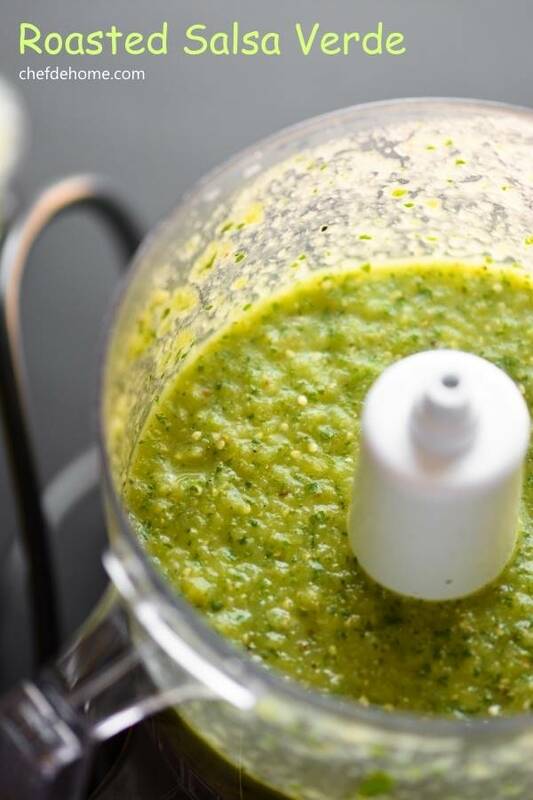 The ease of cooking without using many pans and pots. 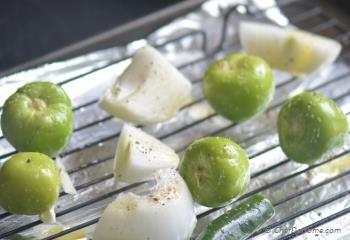 Most work is done in oven, from roasting tomatillos to baking salmon. 2. I often have some leftover rice... Or boiling a fresh batch takes 12-15 minutes. By the time veggies are roasted and salmon bakes... rice are ready! 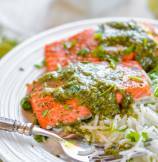 A quick mix of cilantro, salt, some oil and lime juice enhance the flavor of rice and compliments the roasted Salmon perfectly. Test Kitchen has shared perfect instruction to bake salmon. They ask to score the fish on skin side, heat the oven at 500 degrees and then lower it at 350 to bake perfect flaky salmon in just 9-13 minutes. 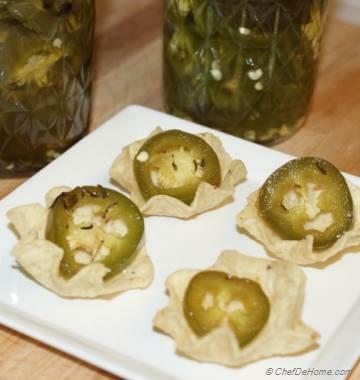 I preheated the oven to 500 and first used it to broil tomatillo, white onion and jalapenos. After roasting tomatillos, I left the oven on and reduced the temperature to 350... then seasoned the fish to my liking and baked it in just 10 minutes! How easy was that?! Tell me?! Who will say no to this beautiful plate of dinner?!? 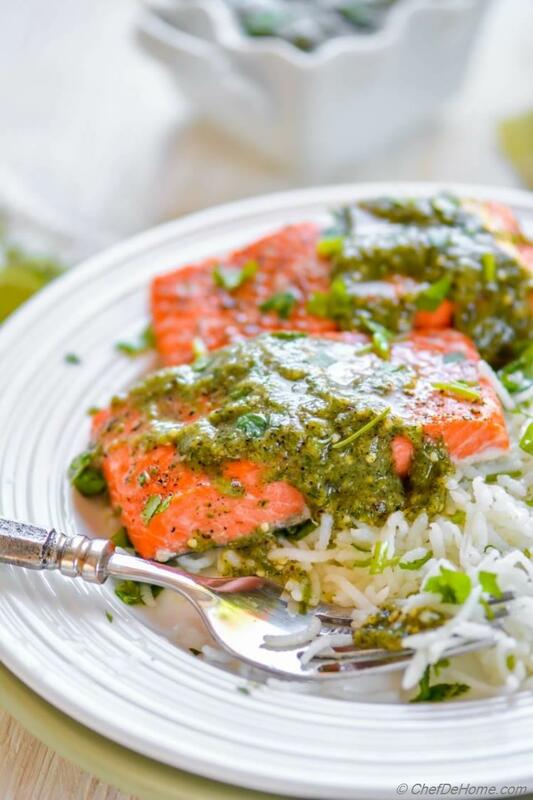 - Perfectly baked flaky salmon soaking in salsa verde with side of cilantro rice! 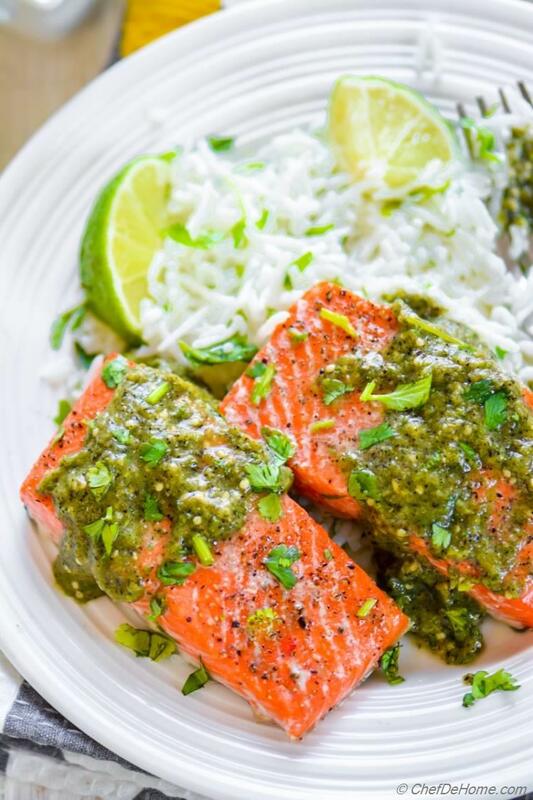 Just so you know, this salmon dinner is low in fat, has good serving of Omerg-3s from salmon, lots of Vitamin-C and antioxidants from salsa verde. If you trying to limits carbs, eat a controlled portion of rice as per your diet-need. Baked salmon dinner is also Gluten-Free. If you can serve this with veggies noodles instead of rice, it can be paleo too. It is not that hard to invest 20-25 minutes for a healthy dinner for weekdays. However, some days when I'm super time-pressed... I finish a lot of the work a day-ahead. 1) Cook and cool rice. i even mix in seasonings and refrigerate a day before. I like to add fresh cilantro just before serving. 3) For weekday dinner, just baking fresh salmon and taking rest from refrigerator makes dinner a 10 minute piece-of-cake! and yummy too! Oh, if you like to use frozen salmon (I'm doing this a lot for weekday..) then don't forget to take it out of freezer and leave in refrigerator section in morning. Or if you forget, just submerged it fresh water and it thaws pretty quickly. 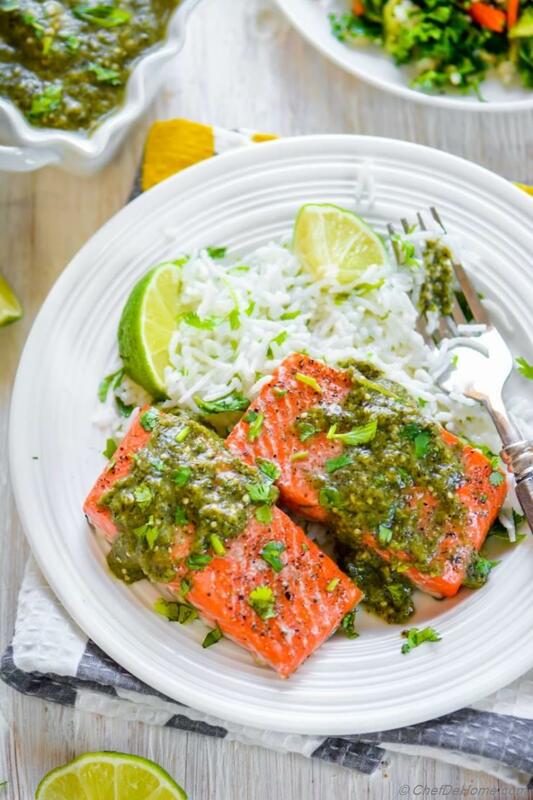 I'm addicted to serving this easy baked salmon with Salsa Verde for weekday dinner! What is you favorite easy pairings with baked salmon? Total Time 25 minutes Prep Time 5 minutes Cook Time 20 minutes Difficulty Easy Yields 2-3 Servings Serves 3 Notes No. of servings depends on serving size. 2. Once roasted, remove salsa ingredients from oven. Leave oven on. 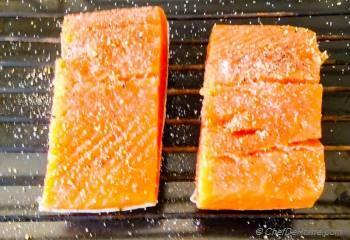 Coat salmon fillets with salt and black pepper. Reduce the oven heat to 350,. Place salmon skin-side down on baking sheet. Bake for 9-13 minutes. 3. Transfer roasted onion, tomato and jalapeno to a food processor. Discard the skin of garlic. Add vegetable stock and puree the ingredients. 5. 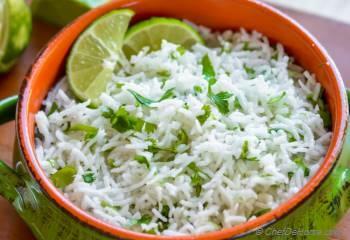 Cilantro Rice - For cilantro rice, in a bowl, mix cooked rice with cilantro, lime juice, oil, salt and black pepper. Toss well. Set aside. 6. 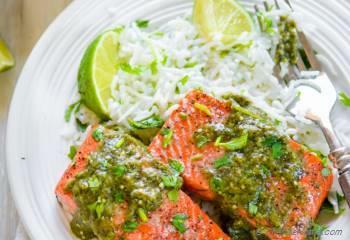 To serve, in a serving bowl, add a serving of cilantro rice, top with a piece to 2 of salmon, salsa verde and lime wedges. Garnish with more cilantro and serve!